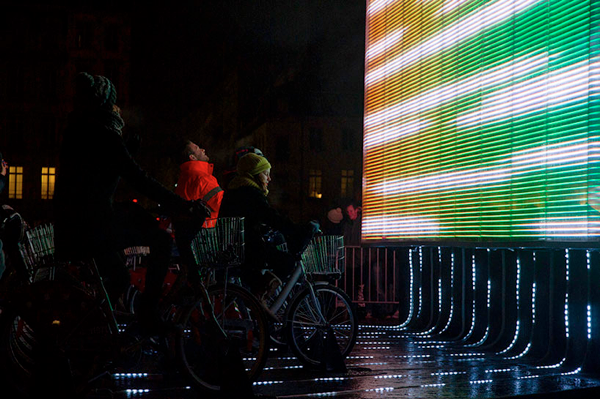 Cyclist-Powered Giant LED Cube Display « Adafruit Industries – Makers, hackers, artists, designers and engineers! the french motion/sound graphics company pixelux studio has recently created an interactive and generative installation that thrives on the power of the collective effort. twenty-eight bicycles connected – through a rather complex integrated system of light, sound, and video – to a continuous three-dimensional display around the statue of the venerated king louis XIV interprets the physical work of the cyclists into a visual and audible display in a three-minute stint. the intensity of the light-show is entirely based upon the exertion of the users, with thebicycles’ top speed being rewarded with an all-white maximum-power light and a fireworks display to reward the riders.